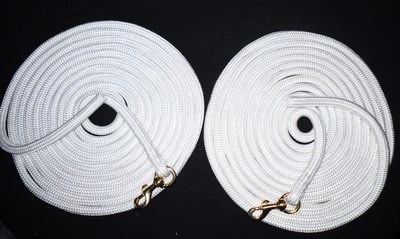 Made with 13mm diameter doublebraid yachting rope. An ideal rope for longlines. Perfect weight, strong and tough yet soft, flexible and with low abrasion qualities. Completely weatherproof, they can be left outdoors all year round and will stay soft and flexible. Each longline has a solid brass swivel trigger clip. This is connected to the rope by a correctly constructed eye splice. The other ends are backspliced for double thicknesses at these points. Use two as longlines or a single one as a 22ft training line for Natural Horsemanship training. These longlines are easily cared for as they can be hand or machine washed on a cool cycle.